Like most common names, "Spurwing" can refer to more than one taxon. They're previewed below, along with 4 specimens. For more detail click through to the scientific names. These are often called Spurwings. 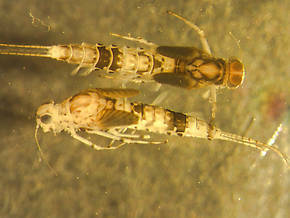 These species were previously in Centroptilum, a genus no longer represented in North America. They are closely related to the important European "Spur Wings", a name given them due to the hook on the leading edge of their hind wings. 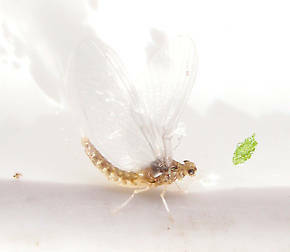 These very small mayflies are usually reported in this country as inhabiting water too warm and/or stagnant for trout but this is not always the case. Significant numbers have been reported in many cold water environments throughout the West. 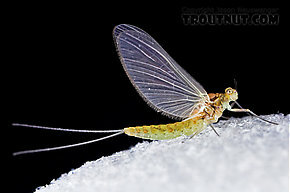 These tiny sulphurish mayflies are easy to confuse with small Pale Morning Duns which is perhaps the reason for their under-reporting by anglers. Their having only two tails is the easiest to way to tell the difference. From an angling perspective, a downside of many taxonomic advances is the loss of what was thought to be the ability to use easily identifiable morphological differences for determining between genera. This is especially problematic in sorting out baetids. The truth is the old rule used by anglers involving the hindwings (i.e., spurwing - prev. 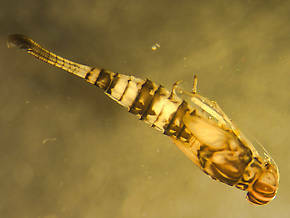 Centroptilum, no wing - prev. Pseudocloeon, the rest - Baetis) has been dubious for years. They can no longer be applied as more has been learned about new genera and species properly reassigned. It is now recognized that some species of Anafroptilum and Baetis lack hindwings altogether. Anafroptilum conturbatum (Tiny Sulphur Dun) Mayfly Nymph View 2 PicturesA moderately rare mayfly perhaps because the nymphs are fragile that nymphs are usually damaged in collection making identification more difficult.